So in my childhood ever since i started school around 7 years old, i had problems on my thighs, well because wearing skirts that are kinda short, they dont cover the chair on which i sit on and i get rashes as a result. Soooo. I got my first few tubes of steroid from the pediatrician. I think it was elomet. I was told to apply sparingly and thinly. I think i applied alittle, not much. Cant really remember. Maybe my mum applied more for me. But it came and went, I learn to sit on clean places ~_~ and be more particular about cleanliness. It wasnt a problem for me. So i moved on to secondary school when im 13. First 2 years was fine. Next 2 years when im 15/16 i begin to see more of eczema. It wasnt diagnosed yet as such until probably in sec 3 or 4. I always referred to my dry skin and red patchy areas as “sensitive skin” due to contact with dirty bedsheets/chairs etc. I was referred to National Skin centre when things got alittle serious. My experience there was something like this: i waited to see the doctor, after that spent afew quiet minutes in the room(doctor didnt really tell me any risk about it etcetcetc and it was a different doctor each time! ), then waited in the reception, collected my steriods from the pharmacy and went home. So the doctor gave me some steroids cream (which didnt work wonders for me) and the doctor didnt really tell me any risk about it etcetcetc . Then i went on to Junior College. I felt it was one of the times i felt the most stressed. I wasnt doing well in school, and my skin was terrible. I dont know if it was my skin that made me stressed or the other way round. At that time i would often itch much and scratch my legs raw and bleeding at night.. I missed some sleep too. Maybe thats why i didnt do well in school? My relative then introduced me to a dermatologist she sees at Gleneagles. And that was the start of trouble i felt. The doctor, like all dermatologists, prescribed me lots of steroid creams. First it was Desowen Cream (0.05% Corticosteroid) for the patches on my face. and a stronger one for my legs. The first time i applied Desowen on my face, i always thought it smells weird and stinks! But well , i saw some results. More Desowen creams for the face. I think i easily used about 10 tubes? On the 3rd try, i was reluctant, becos i clearly felt the re-lapse that was so fierce and depressing. (but the results was amazing while it worked) But i took it anyway. At that time i knew, oral steroids were serious stuff with re-lapses and i need to taper off slowly. The fact that stopping abruptly could kill, kinda freaked me out alittle. 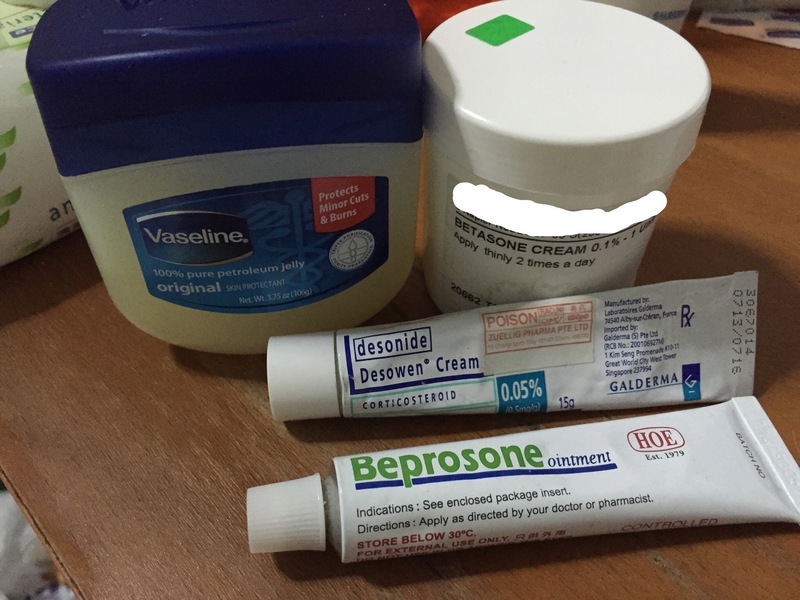 Beprosone ointment (Betamethasone 0.05%) I received 2 tubes but didnt use even half of it. She was always saying im under-medicating. I guess thats good for me, looking back.